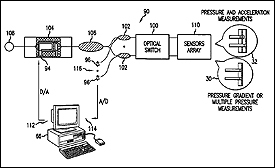 ISR-affiliated Assistant Professor Miao Yu (ME) and Professor Balakumar Balachandran (ME) have been awarded US Patent 7,428,054 for "Micro-optical sensor system for pressure, acceleration, and pressure gradient measurements." The invention is a micro-optical fiber tip based sensor system for pressure, acceleration, and pressure gradient measurements in a wide bandwidth, the design of which allows for multiplexity of the input side of the system is based on micro-electromechanical fabrication techniques. The optical portion of the system is based on low coherence fiber-optic interferometry techniques which has a sensor Fabry-Perot interferometer and a read-out interferometer combination that allows a high dynamic range and low sensitivity to the wavelength fluctuation of the light source. A phase modulation and demodulation scheme takes advantage of the Integrated Optical Circuit phase modulator and multi-step phase-stepping algorithm for providing high frequency and real time phase signal demodulation. The system includes fiber tip based Fabry-Perot sensors each of which has a diaphragm that is used as a transducer. You can view ISR patents at any time on our patents page.